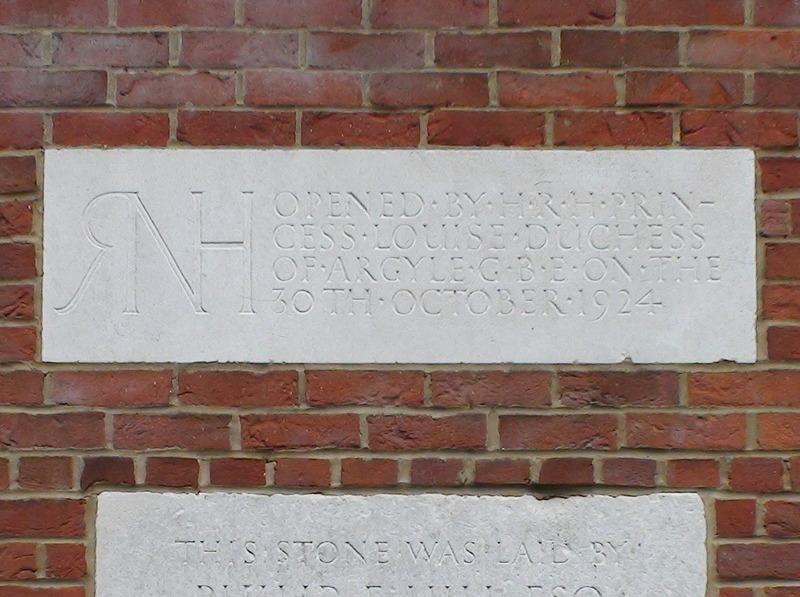 Opened by HRH Princess Louise Duchess of Argyle GBE on the 30th October 1924. In 1997, as a condition of developing the RNH site, Bellway Homes (the developer) was required to create one acre of public open space - this garden which was opened in 2002. Bellway's buildings surround the park on 3 sides. An information board near the gates to this park tells us that this wall incorporates some of the original decorative masonry, etc. from the Royal Northern Hospital. This includes four decorative rain water hoppers: two dated 1924 and two dated 1930. 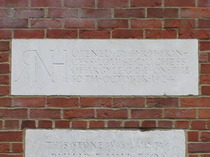 War memorial, St David's Wing, Casualty, Princess Louise and Hill, NJ. The mosaic is on the terrace in front of the wall. See the mosaic for more information about the Casualty Department. George Romney, 1734 - 1802, painter, lived here.